Per usual, this one is pretty tough to decipher. 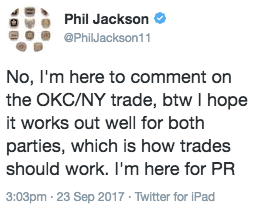 Phil Jackson, who was fired as Knicks president and general manager in June, mentioned the Carmelo Anthony trade in a tweet shortly after the Knicks dealt Anthony to the Thunder. He deleted the tweet shortly after it was posted, but it can be read below. Per usual, Jackson's initial meaning was unclear. Did he mean to type "not here to comment"? That would be odd because he literally commented on the trade right after that. Also, what does "PR" refer to? Press relations? Personal record? He cleared up the PR mystery with a subsequent tweet. I coached in both Quebradillas and Isabela in the 80's. The good folks in those two communities have been hit hard by Hurricane Maria. He meant Puerto Rico, and is using Twitter to draw attention to the devastation there caused by Hurricane Maria. As far as whether he meant to type "not," we may never know.